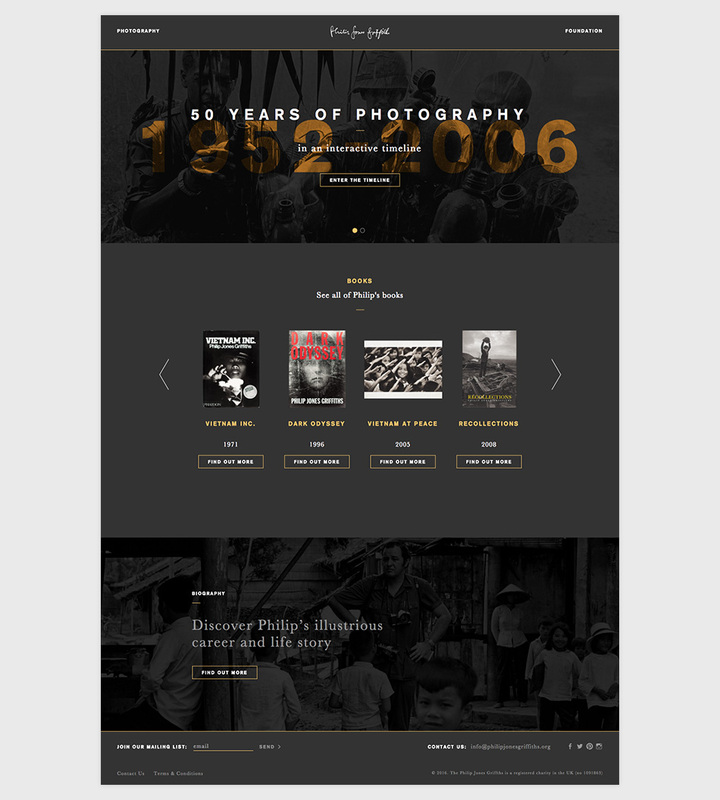 Website design for Philip Jones Griffiths Foundation to showcase the extensive archive spanning 50 years and 120 countries of the most influential Magnum photographers of his time. In 2001, Philip launched the Philip Jones Griffiths Foundation to begin the work of preserving his archive. 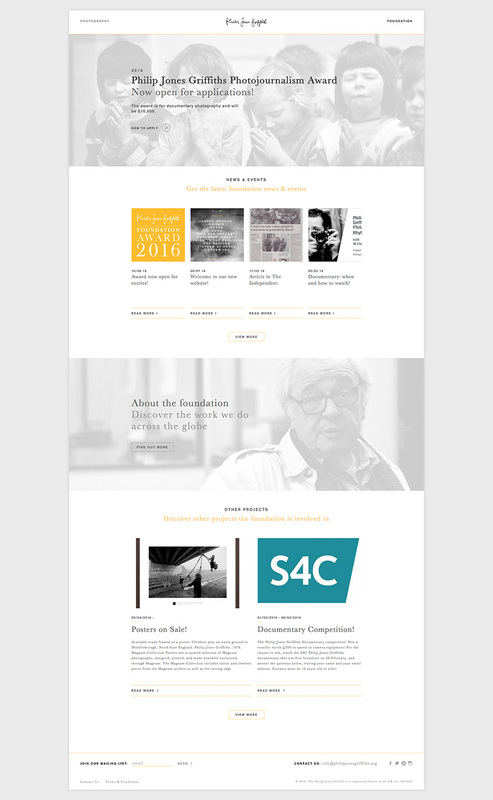 And after many years of discussion and having already completed a number of publications with Philip, as well as designing the identity for the Philip Jones Griffiths Foundation, we finally started the formidable task of bringing his stories/archive online. With his projects spanning a period of more than 50 years across 120 countries, including 150,000 slides and 30,000 prints, our initial responsibility was to consider the best way to organise/collate and then present the works. We had an Excel document as starting point with all of Philip’s projects listed in chronological order with a photo selection for each project, which had initially been penciled in as simply that in the site. But we wanted to make it more visual – it had to be. 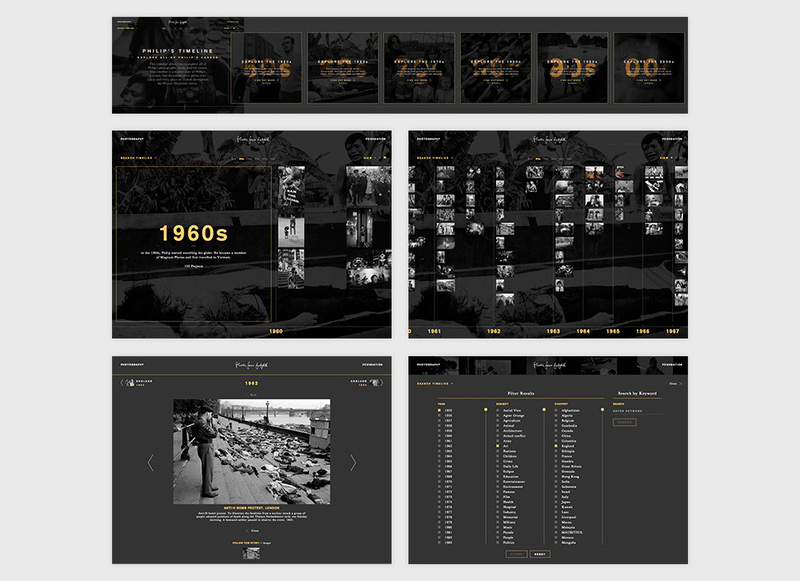 Being a section that we wanted to promote more heavily, we proposed a more interactive image-led timeline that would be more arresting and engaging for visitors. 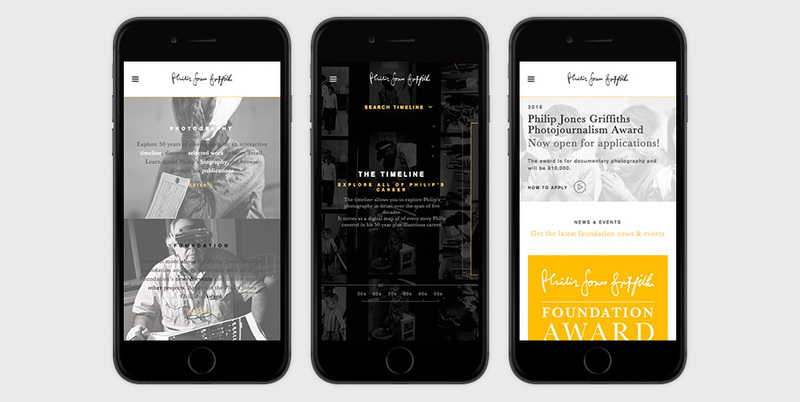 By packaging the projects into decades we could offer a more accessible browsing experience through Philip’s illustrious career for visitors. Philip indicated that certain projects and subjects formed the backbone of his work, projects he felt were most important to him. The Special Projects area has been dedicated to spotlight these stories. Within each of these entries, one can see a more detailed and curated depiction of each body of work, and find all related works in the timeline and related books in publications. 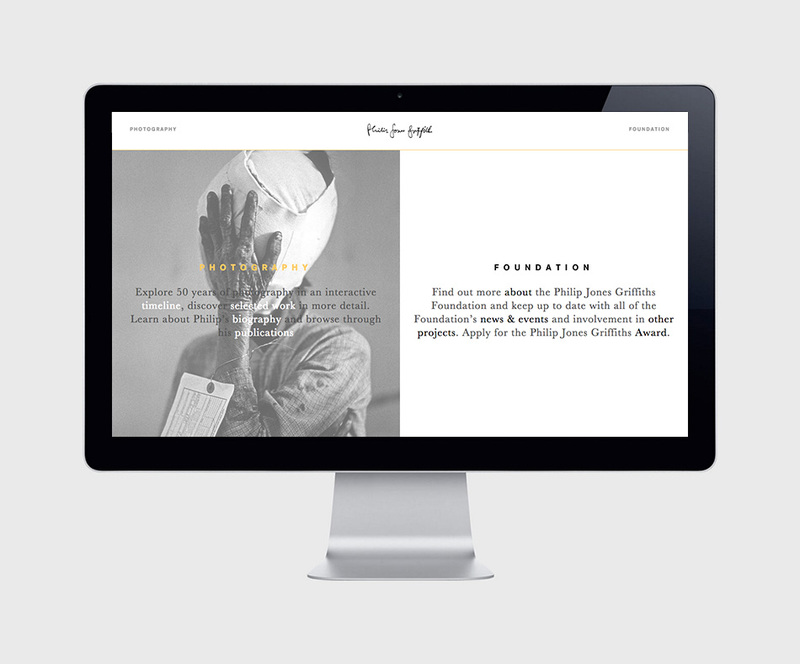 Another key proposition for this website was to build a platform for the PJG Award, where the users could submit 3-10 photos and project description directing through the website via a front-end uploader, for the foundation to then manage, process and forward on to the judges selected for the year’s award. Considering the collating of submissions and making it as easy as possible to manage the hundreds/thousands of entries were critical in delivering a system that the foundation could continue to use as the Award grew year on year. 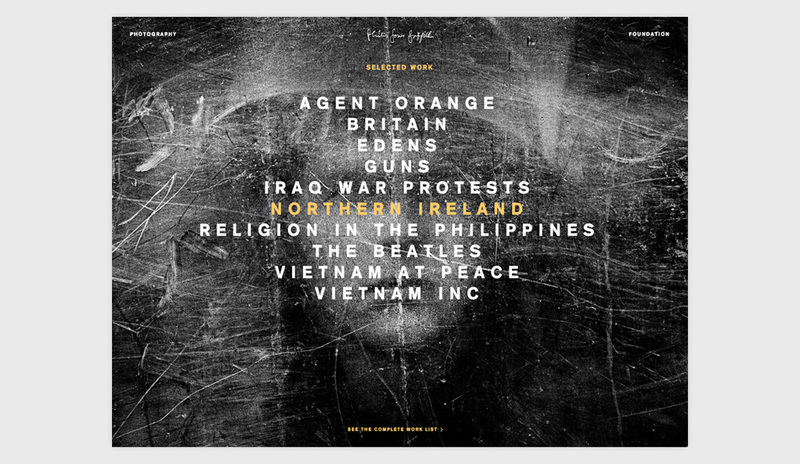 The inclusion of a lightbox submission viewer for the judges helped make the winner and runners-up selection quicker and even easier for them. Philip Jones Griffiths (18 February 1936 – 19 March 2008), Welsh photojournalist known for his coverage of the Vietnam War. Associate member of Magnum since 1966. Member from 1971. President of Magnum in 1980, a position he held for a record five years, the longest term ever served by a single member.